Colorado’s varied climates and altitudes pose a problem for many gardeners and tree farmers. Although some types of nut trees require warm and humid climates, many varieties thrive in the state of Colorado. Successfully growing nut trees in Colorado requires careful tree selection, as well as proper planting procedures. Plant a few nut trees in your landscape and enjoy the ornamental attraction, as well as the tasty produce of mature specimens. Determine which climate zone in which you reside. Find your location on the U.S. Department of Agriculture’s Plant Hardiness Zone Map. 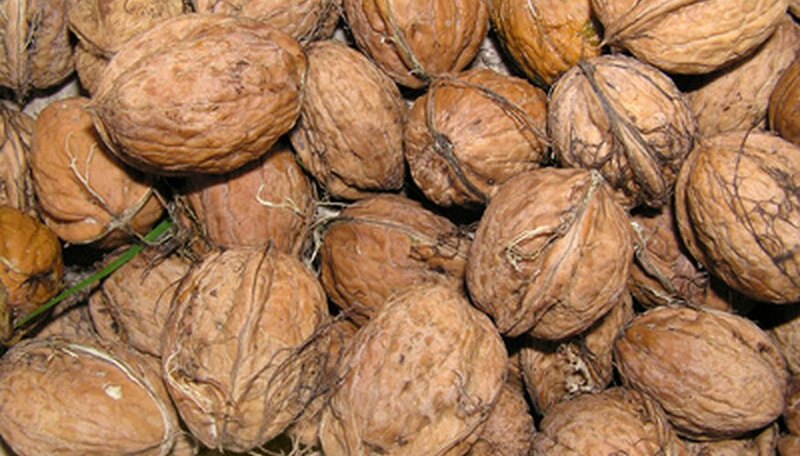 Purchase nut tree varieties labeled for growth in your Colorado climate zone. Avoid choosing warm-climate varieties, such as pecan trees, which thrive in the semi-tropical, southern states. Choose varieties, such as black walnut and pinion, which flourish in many Colorado locations. Find the best area on your property for planting your nut trees. Select an area that receives a maximum amount of daytime sunlight. Avoid placing nut trees in narrow valleys or near the bottom of slopes and hills. Cold air settles in these low areas, creating the chance of frost damage during cold, Colorado winters. Add soil nutrients and amendments to your existing soil. Nut trees prefer well-drained, fertile soils. Many areas of Colorado experience shallow levels of topsoil. Increase the nutrients in these soils by adding compost and mulch. Work these into the topsoil with a garden tiller to provide a rich blend for your nut trees. Dig large holes for your new trees. Measure a circle about 3 times larger than the tree’s rootball for each plant. Dig deep enough to place the level of the trees’ rootballs slightly above the level of the surrounding soil. Do not loosen or disturb the soil beneath this level. Set each nut tree’s rootball in your prepared holes and backfill with removed soil. Gently tamp down to remove air pockets. Water your nut trees frequently. Many areas in Colorado receive minimal amounts of rainfall during the growing season. Add enough water to your soil to provide a steady level of slight moisture near the roots. Check the level of moisture by digging a very small test hole near the base of a nut tree. The soil near the roots should feel cool and slightly moist. Mulch the nut trees in your Colorado landscape. Spread a 3- to 4-inch layer of straw, shredded leaves or wood chips beneath each of your nut trees. Wrap the trunks of your nut trees around Thanksgiving to protect them from damage caused by foraging animals and Colorado's cold winters.